Three hundred and sixty-six miles east of San Jose, California, at the northern end of the Owens Valley, sits the city of Bishop, California at an elevation of 4,150 feet. It is part of Inyo County and is the largest populated place in the rural county. The county is also home to the highest peak in the lower 48 states, Mount Whitney, and Death Valley, the lowest point in the U.S. In the mid to late 1940s, the foundation was laid to provide health care services to this rural area. The first Hospital District in California was formed and established to fund a hospital and Northern Inyo Hospital opened its doors by the end of the decade. Renovations throughout the 1960s and 1980s, and a major renovation in 2012, allowed the nine-acre hospital campus to evolve into a modern facility. Today, the Northern Inyo Healthcare District continues to support the health care needs of the local community – as it has for decades. A small clinical engineering department supports the hospital and several clinic locations. 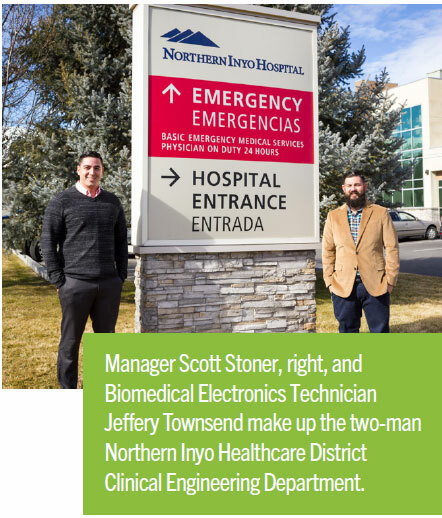 “We are a two-person department under the name of clinical engineering,” says Scott Stoner who manages the CE department. Stoner has eight and a half years of biomedical experience, 19 total years working in the electronics field and has an A.A.S. degree from Vincennes University in Vincennes, Indiana. He has also completed the DITEC Level 1 radiology course. Biomedical Electronics Technician Jeffery Townsend has seen his first year of biomedical experience, and holds a diploma from SCIT as biomed technician and certification from CSHS as an EKG technician. In addition to the 25-bed critical access hospital, clinical engineering supports 86 patient bays/rooms that are not considered beds, across seven clinics, the emergency department, pre and post-OP and several other locations. They also support three operating rooms. To hold down the clinical engineering duties as a two-man department in a rural area, the biomeds have to be up-to-speed on everything. “Generally speaking, we are well-rounded biomeds. We provide first call for all modalities. Over the years, we have received overview training from many vendors. We try to go with a field service tech whenever they come on site to learn and better understand the equipment,” Stoner says. He says that the knowledge and experience service techs carry with them is invaluable. “Most of them are willing to share and teach us so we can better support our clinical staff and ultimately our patients. Living in a rural location, it is imperative we learn as much as we can about every device we can potentially service, with support of equipment manufacturers and FSEs, we can first call and fix many issues leading to a reduction in downtime,” Stoner adds. Stoner is formally trained with Coviedien ESUs, Philips patient monitors, DITEC level 1 and will be seeking formal ventilator training this year. Townsend is enrolled currently with Conquest Imaging for general ultrasound. The small two-man team provides general biomed services, PMs and break-fix services. They also provide advisory for clinical departments regarding clinical equipment acquisitions. “We check to make sure it is FDA approved, the device is intended for the use requested, fits into standardization, is compliant with hospital policy and procedures and if it can be supported by other departments such as EVS/infection control or ITS,” Stoner says. He says they also provide contract oversight for service or acquisition of equipment to ensure unneeded or redundant services are not being added in. The team also provides training on use of medical equipment and systems as well as root cause analysis for any break down in patient care related to equipment/supplies. What level of integration does the team have with IT? “We combined to report to the ITS director less than two-years ago. Unique challenges, as from the outside it seems they would go together, and in some aspects, they do, but we perform separate functions in the overall area of technology. Moving forward this collaboration will continue to grow,” Stoner says. 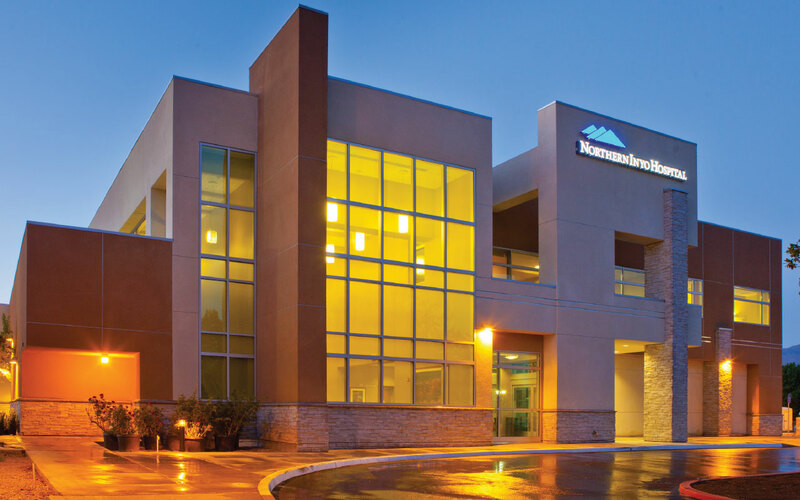 CEO Kevin S. Flanigan, MD, believes Northern Inyo Healthcare District streamlining the organization by integrating CE into ITS was simply intended to parallel what was happening in other areas of the organization. This integration however; has been the shining star of that process. “With Scott Stoner leading the charge under the Districts ‘One Team’ mentality, we have seen a complete integration resulting in huge cost savings, tremendous efficiencies and an area that was previously a cost center is now a leading cost savings area. In essence, this integration and Scott Stoner’s team in particular, now saves enough money annually to justify the cost of having a clinical engineering team at such a small facility,” Flanigan says. Stoner says that they are currently working on bringing their patient monitoring network in-house and supported by both CE and IT, allowing for cost savings and less down time. Attempting to handle all of the biomed duties between two people doesn’t allow for many “special projects.” Yet, the team still remains involved and engaged. “We participate in equipment acquisition, equipment installation, alarm fatigue committee, project planning/prioritization, change committee (process changes) and EMR integration (this one is difficult and typically research and development work related),” Stoner says. He adds that the pair recently implemented a new CMMS and deployed temperature monitoring throughout the hospital. They have also participated in Adopt a Highway – highway cleanup volunteer, as well as volunteering with the hospital foundation events. “We exercise a one-team/one-goal mentality with the rest of our facility,” Stoner says. In the problem-solving category, the team has been involved with CO2 monitoring post anesthesia to meet the 24-hour requirement. “Currently, there are no Telebox’s that support CO2, only standalone units or combined with a patient monitor or IV pump,” Stoner says. “We are in the process of acquiring new X3 monitors from Philips to be used as teles for patients requiring CO2 to satisfy the 24-continuous-requirement, while it automatically charts and saves data which is viewed in real time by our teletech position in the ICU,” he adds. Outside of the workplace, the two-man team attempts to attend conferences. “Due to our remote location, we are unable to attend some of the smaller activities,” Stoner says. “We have, and plan to continue, attending AAMI and possibly MD Expo [and] wish we could attend CMIA,” he adds. “I am currently working on creating a forum for critical access hospitals in California; specifically for biomed/CE/HTM,” Stoner says. “We are a rarity in the world of health care these days, but we all share similar, unique issues that are specific to these locations. We typically have lower patient volumes compared to large facilities, however we operate in such a way to provide those same great services a person would expect from a large facility,” he adds. He says that for CE, this means the biomeds wear many hats. “We hold a large inventory of active equipment (1482-pieces, not counting O2 regulators and the like), we work with minimal staffing to accomplish all of this. In many cases, we do not have a larger body above us in which we can share resources or ask for historical data when it comes to equipment selection. I work on this in my free time which is a rarity as well,” Stoner says. With Death Valley nearby, it takes a special kind of health care facility and a devoted pair of biomeds to keep patients healthy and equipment running. The CE team at The Northern Inyo Healthcare District accomplishes this task every day.